Tadasana feet: what is parallel? In the mirror I saw my feet aligned in Tadasana. I then repositioned them to show my natural alignment, a bit more outwardly turned (yet still more or less parallel). That made me reconsider my Tadasana feet: To avoid excess turnout (a common misalignment), have I been overdoing it the opposite way? 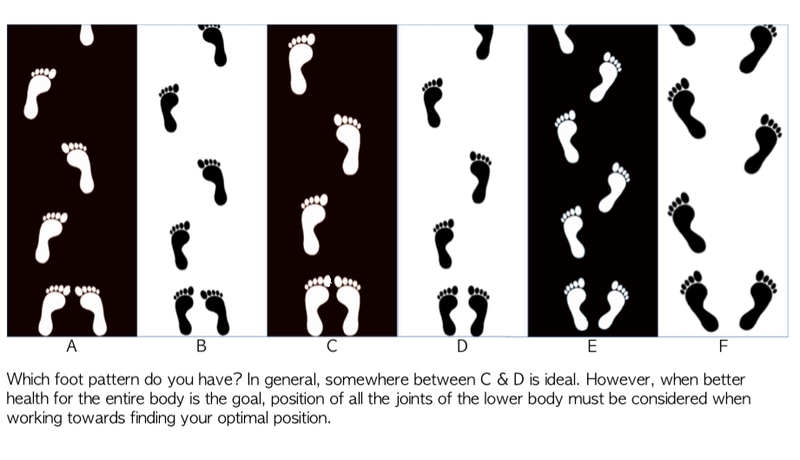 Determining whether feet are parallel requires observation of the “midline” of the foot–a line between the second and third toes to the mid heel. 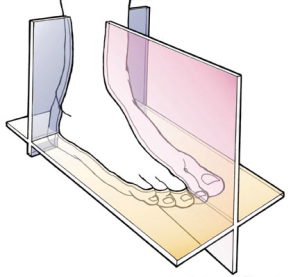 If your feet are narrow and oblong, both inner and outer edges will be parallel, along with the midlines. If your feet are wedge shaped like mine, the outer edges will angle outward even when the midlines are parallel. In classic Tadasana, the feet stand side by side and thus cannot turn inward beyond the body’s midline or sagittal plane. Likewise, standing with a block between the feet parallels their inner edges. So, why do many yoga practitioners toe in farther? In some poses, such as Prasarita Padottanasana, we’re often taught to parallel the outer feet, causing a pigeon-toed stance. While it’s wrong to point the toes outward, isn’t the opposite also detrimental? For more food for thought, read Palo Alto-based posture expert Esther Gokhale‘s highly informative (and visually compelling) book 8 Steps to a Pain-Free Back. She recommends standing with feet and legs a bit externally rotated (to ground the outer soles; to lift the inner arches), based on years of comparative anatomy/kinesiology research. Sometimes an opinion from outside the yoga world can be thought-provoking. Whether right or wrong, it forces us to rethink our assumptions and habits. Interesting post. I have found midline of the foot is a good reference in many cases. However, if there is ever a need to broaden across the back pelvis/sacrum region, then I find slightly over turning the feet (toes in, heels out) very effective. For me personally, learning to do this had a profound impact on relieving my back pain. Love your posts YogaSpy – keep ’em coming :). Thanks for making a good point, Stephanie. There are times when I, too, purposely toe in slightly, e.g., before pushing up into Urdhva Dhanurasana, to keep my thighs parallel, my sacrum wide. Other times, I find that toeing in over-stretches the outer ankles. Perhaps the main criteria involve the rest of the body: How is foot position affecting the ankles, knees, thighs, hips, sacrum, etc? And each of us will have a different answer! Absolutely, and I would even add to the criteria, ‘for what purpose are you doing the pose?’ For ex. Prasarita Padottanasana with the aim of soft groins might look different than for strong arches… it was so great to meet you as well! I hope all is well over there on the west coast and i look forward to our yoga paths crossing again soon 🙂 if you ever find yourself Toronto-bound, please be in touch. /stephanie. Previous Previous post: Have you ever cried in yoga class? Next Next post: Pelvic tilt: how much is too much?